Brett Dean’s new opera Hamlet, which had its world premiere at Glyndebourne Festival 2017, has won World Premiere of the Year at the 2018 International Opera Awards. Vladimir Jurowski, who conducted the production, was awarded the Conductor of the Year prize. 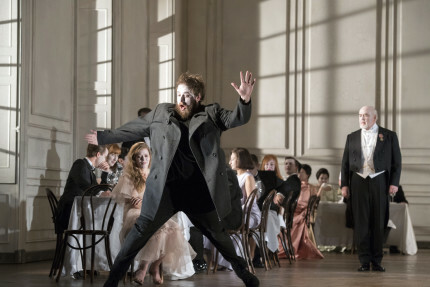 Hamlet was commissioned towards the end of Jurowski’s time as Glyndebourne’s Music Director (2001 – 2013) and marked his first return to the company since completing his tenure. The new opera is the work of composer Brett Dean and librettist Matthew Jocelyn and was staged by director Neil Armfield. It had its world premiere at Glyndebourne Festival 2017 and was staged with a new cast for the 2017 Glyndebourne Tour. Other winners on the night include Paul Steinberg who designed the sets for Richard Jones’s production of Strauss’s Der Rosenkavalier which is being revived at the 2018 Glyndebourne Festival. With over one hundred finalists representing six continents and thirty countries, the winners were selected by an international jury chaired of by John Allison, editor of Opera magazine and classical music critic with The Daily Telegraph. Highlights from the ceremony will be broadcast on BBC Radio 3 on Sunday 15 April at 9.15pm.